Social deficits represent a core feature of autism, and are perhaps the most studied. But their molecular origin is unclear, in part because of the dearth of animal models that accurately recapitulate the impairments. Many researchers turn to mice — social animals that are relatively easy to manipulate experimentally. But mouse mannerisms simply don’t compare to people’s complex social behaviors. Monkey behavior is at least one step closer, which is why Karen Parker is studying rhesus monkeys with naturally occurring social deficits. 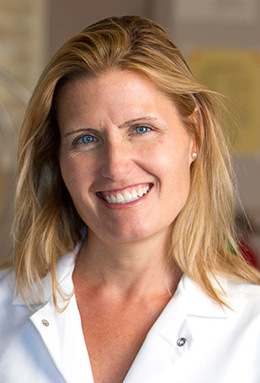 Parker, assistant professor of psychiatry and behavioral sciences at Stanford University in California, is working with a team at the California National Primate Research Center in Davis to assess the social behaviors of thousands of rhesus monkeys. 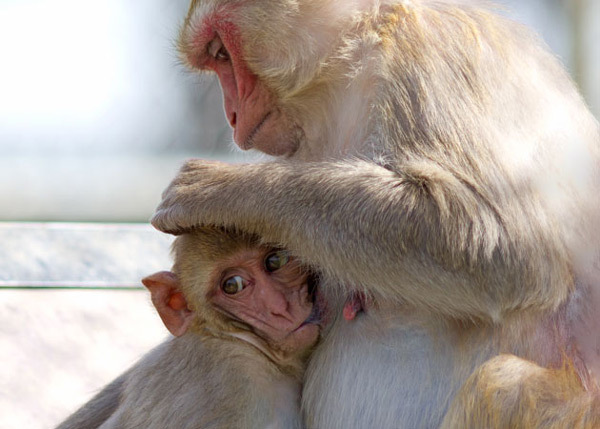 Like people, rhesus monkeys tend to be highly social. And, like people, their social abilities vary widely. Parker and her colleagues devised an algorithm to discern monkeys that are naturally highly social from those that are relatively antisocial. They plan to look at samples of blood and cerebral spinal fluid from these animals to find biological signatures of social impairments. They also hope to identify new molecular targets for drugs to treat the social deficits associated with autism. Karen Parker: When we started this project, I was thinking about how social traits are distributed across the human population. We know that people exhibit individual differences in social functioning, ranging from having really high social competence to low social competence, and then possibly into the autism spectrum. And we know that relatives of individuals with autism often show subclinical traits. We actually see something similar in rhesus monkeys — they show stable and pronounced differences in social functioning. We study animals in a large rhesus monkey population to identify monkeys at the behavioral extremes — monkeys that show extremely high or low social behavior. SFARI.org: What do social impairments in monkeys look like? KP: What we know from previous work is that the animals that have social impairments initiate fewer interactions. We also know from some of the work that we’ve done that they seem to play and groom less. Playing and grooming are two socially motivated behaviors that are critical for this species. Social grooming is really important in maintaining social bonds in primates. This behavior requires a significant amount of social competence to perform successfully, as does play. But what nobody has yet done is develop sophisticated social behavior tests, like people have done in mice, to ask: How do these animals differ? What is the type and severity of these social impairments in ‘low-social’ versus ‘high-social’ monkeys? SFARI.org: How do you identify monkeys with extreme social behavior? KP: We decided to use a rich dataset collected by my collaborator, John Capitanio, at the primate center, which has more than 5,000 rhesus monkeys. For the past 13 years, he’s been collecting data on behavior in infant monkeys. The assessments take about 24 hours and consist of video playback experiments, a working memory task, temperament assessment and behavior observations. What I wanted to ask was, given that we have behavioral data on a really large number of animals in the colony — 4,100 animals — is there a way that we could use their behavioral scores on this early infant testing paradigm to predict later social functioning? We started with a group of 90 monkeys that we knew were high or low in social functioning based on detailed, quantitative social behavior data. Then we created a statistical classification algorithm to figure out which scores predict high or low social functioning. What we’re doing now is trying to validate this statistical classification algorithm as a high-throughput screening tool, so we can rapidly identify monkeys that are predicted to be high or low in social functioning. We have tested more than 200 monkeys. We’re also taking biological samples from the animals to ask whether candidate neurobiological systems that we think are involved in autism or critical for social functioning in mammals are altered in ‘low-social’ animals. SFARI.org: How will you analyze these samples? KP: We’re taking cerebral spinal fluid, blood samples, and we’re banking DNA, RNA and plasma samples from blood for future analyses.We’re looking at oxytocin and vasopressin, two neuropeptides critical for social functioning. We’re also looking at two signaling pathways implicated in autism: the RAS/MAPK pathway and the PI3K/AKT pathway. These are some of the candidate systems we think may be altered in ‘low-social’ animals. If we see that a certain biomarker signature is more likely to be associated with ‘low-social’ monkeys than ‘high-social’ monkeys, and if this biomarker signature correlates with the degree of social impairment, then the goal would be to use this signature to inform therapeutic studies. Another aim of this research program is to do genetics studies to see whether there is an excess burden of rare, pathogenic variants in low-social monkeys, similar to what we see in people with autism. SFARI.org: What can the social impairments tell us about autism? KP: I am extremely careful to never, ever say a ‘monkey model of autism.’ What we’re trying to do is model a social endophenotype that we think has some relevance to the social impairments seen in autism. If we can show that the biology or the genetics involved are similar to what we see in humans, then that will allow us to converge on this idea that some of the biological and genetic pathways may be shared with individuals with autism. SFARI.org: What are the next steps? KP: I want to engage in expanded biomarker discovery efforts. Can we do other forms of biomarker analysis that might reveal novel drug targets? What I’d really like to do is develop a ‘fast-fail’ therapeutic screening tool so we can quicklytest the efficacy and safety of promising candidate drugs in ‘low-social’ monkeys. I’d also like to look at the long-term safety of these compounds. Sometimes when you dose acutely, meaning a single dose or a few weeks of dosing, you may see that compounds can be efficacious in animals. We’re quick to start testing those in people. But we often don’t know the long-term safety profiles of these drugs across child development, and that’s something we can test in a rhesus monkey model.